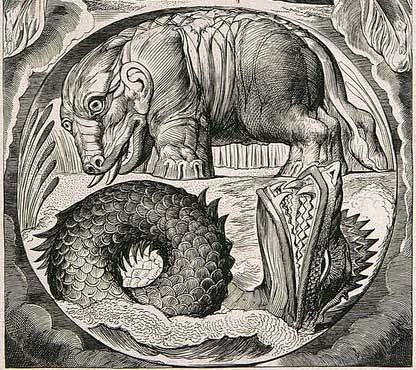 underside like jagged potsherds, smoking nostrils, snorting flashes of light and shining rays from its eyes, making the depths churn like a boiling cauldron. 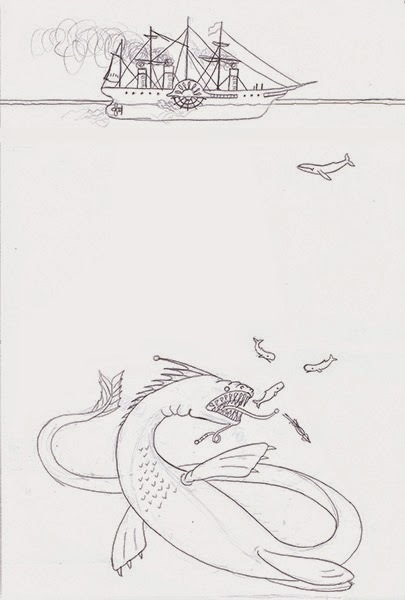 And of course it’s big big big - big enough to eat other monsters that are hundreds of feet long. 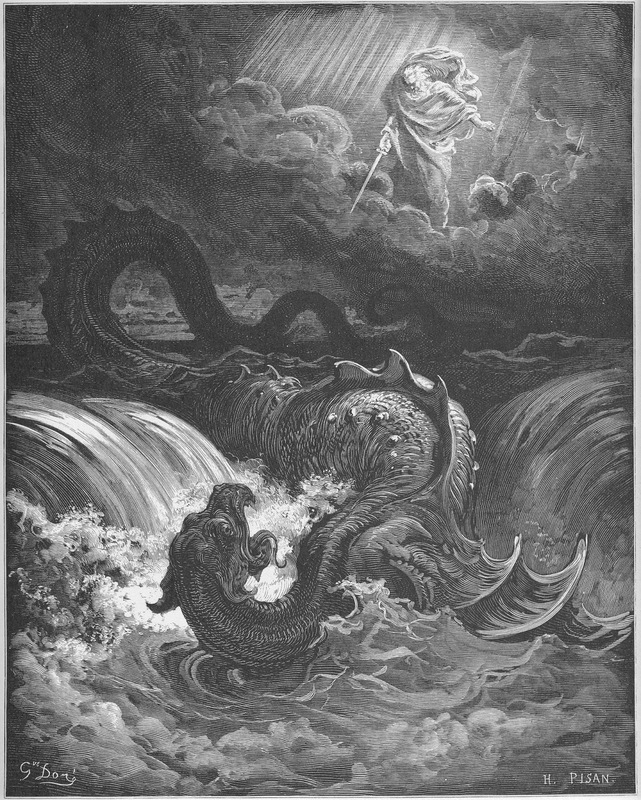 My general concept for depicting the leviathan came from this image of St Brendan by Robert Gibbings. I liked the idea of the boat at the top and the depth of the ocean below, but I was thinking of a much bigger ship, a much deeper ocean, and the idea that the tiny humans at the surface are utterly oblivious of the immensity of life in that unexplored, alien world below. 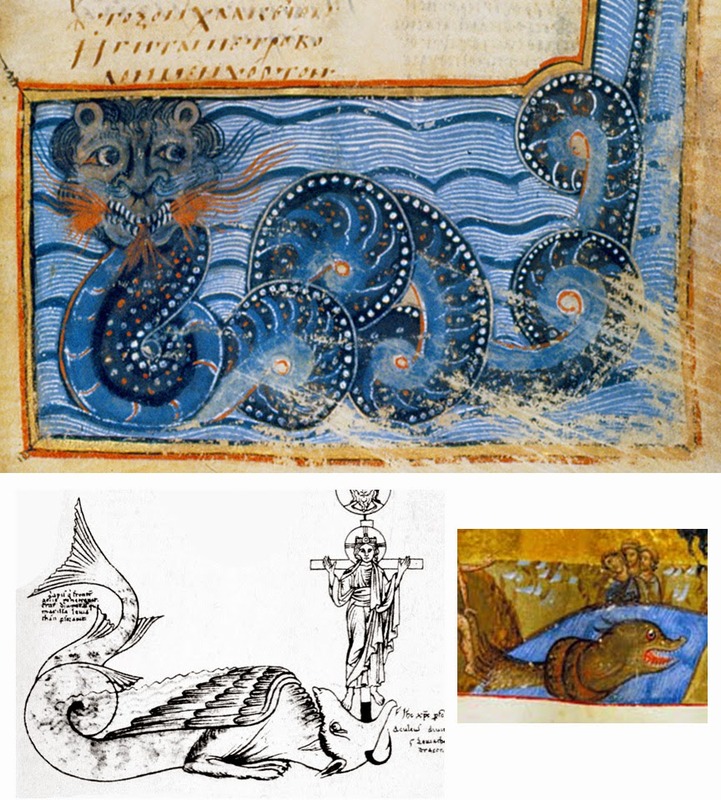 I wanted to make all the sea creatures to scale, including tiny whales, for comparison with my enormous leviathan. somewhat between Great Eastern and Great Western (though closer to the smaller). creature of the absolute deepest chasms of the ocean, or we’d hardly have missed seeing it more often. I drew and redrew him many times, having an especially hard time with the fins, but I’m fairly satisfied with his general look now. Here’s what I’ve got so far. I still need to finish populating my ocean and making some decisions about the scheme of black and white and how I’ll do the water. (Not to mention carving and printing the thing, of course.) You will, naturally, be presented with the results of all this in due course. Last weekend was an Open Studios show, and that means carving. I got one block carved and another almost finished over the weekend, and I finished them both on Monday and printed on Wednesday. So here’s the first. This is the Portland Head Light from just outside Portland, Maine. The design comes from a photograph I took this summer, and I used an interesting technique for the rocks. The problem, oddly, is that they were too random, too jumbled, for me to have a good sense of what lines to draw to get at the essence of them. On the one hand, it would be fine if I didn’t make them exactly like real life, because who’s going to notice a couple of random rocks along the shore? But on the other hand, it’s pretty clear what I need to draw to make a lighthouse look like a lighthouse, but with the rocks I felt like I didn’t really know where to begin. So I opened the summer’s photograph in photoshop, put a semi-transparent layer over it, and used my drawing tablet and stylus to “scribble” over the rocks, just filling in all the darker areas and ignoring all the lighter areas. I then printed that black and white image and used it as the basis for my pencil sketch to be transferred to the rubber and carved. As I carved I wasn’t looking for patterns or trying to resolve the shapes into individual masses of rocks; I just carved the black and white in front of me. It definitely looks a bit different from what I would have come up without that guide. It’s much squigglier and less outliney than I would have done in a straight sketch. I’m not sure whether it’s better or worse - in some places it looks a bit seaweedy, and in fact there was no seaweed anywhere in the scene! But it was an interesting technique to try, and on the whole I’m fairly well pleased with this one. For my own costume, here are my goggles and gauges. I posted a picture of the mechaniola before, and have made only minor tweaks to it since then. I did want to include this necklace with which I am well pleased even though I can’t really wear it with the costume for fear of scratching and clanking against the mechaniola. On the other hand, I can wear it on non-costumed occasions, which are considerably more plentiful. Tomorrow is Natick Artists Open Studios (if you’re in the greater Boston area, come by and see me this weekend!) and I have been hard at work preparing and setting up. This evening is going to involve a lot of folding and packaging note cards. In addition to replenishing the usual designs, I’ve also put together two new packets for this show: a set of 8 door designs from The Extraordinary Book of Doors, and the set of 4 magical cities. So I don’t have the time or attention today to give you a big detailed introduction to some new and interesting artist I’ve discovered. Instead I simply give you this very cool piece by Xiang Silou. My big detailed introduction to Xiang and his work is here. I didn’t have room to post this piece then, and it’s very different from the work for which he’s best known. It really tickles me! I don’t know whether the title, “Confusion,” loses a little in translation. I think this piece expresses a confusion that’s more like puzzlement, or a surprised bewilderment. 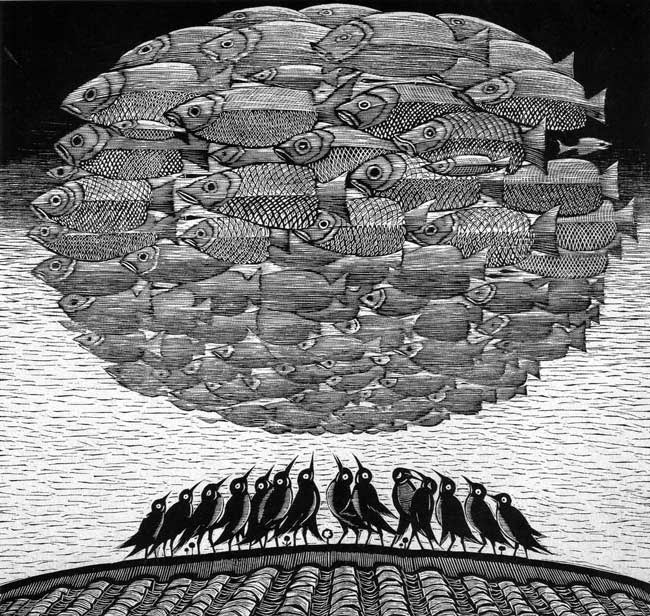 The birds look like they just don’t know what to make of the fish cloud. 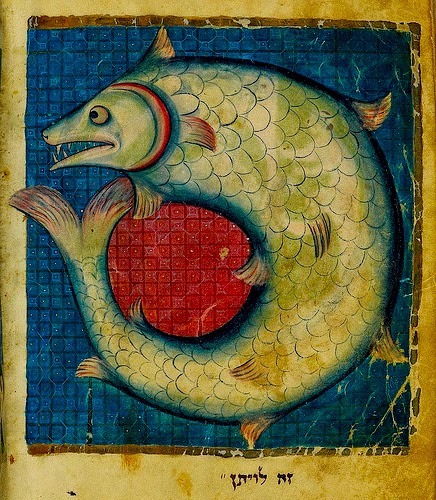 The fish, on the other hand, seem utterly unconcerned about anything. I guess they do this all the time! It's a strange enough story, with the tower no one had ever noticed before, and its inexplicable old woman and her antique spindle, as though wicked fairies have nothing better to do with their lives than spend 16 years waiting to inflict a half-baked curse, and at the end, of course, my sweet, heroic husband, the disenchantment, and the pathetic and hilarious attempts to get my parents, who were always old-fashioned, to understand a son-in-law a century and a quarter younger. 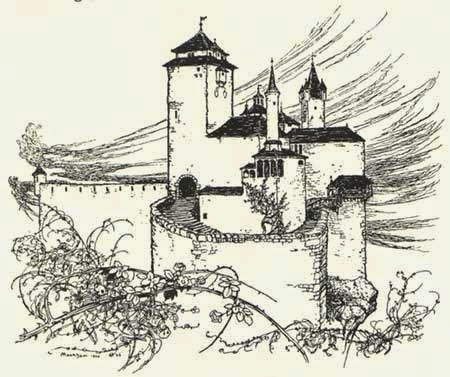 But none of the story, not the flies falling asleep on the walls, nor the fires reawaking unkindled on the hearths, nor the briar hedge that no horticulturalist could identify, not even the happily ever after, was ever so strange and wonderful as my hundred years of dreams. Grew like a hedge as nights grew into years. Above them hovers neither day nor night. The spit across the hearth stops in mid-spin. The flies sleep on the walls, dark grey on grey. doves rest unmourning through the timeless years. The dry leaves through the yard. That is the curse. it has not made the princess lose a night. During this time there is a stranger tale. dreams far more wonderful than fairies spin. PS - Don't forget to come see me at Natick Artists Open Studios this weekend! I'll be showing at the Morse Institute Library on Saturday and Sunday. I came across this piece about a week ago, and thought it was appropriate for autumn. We’re not here yet, actually - most of our trees still have most of their leaves - but I didn’t want to wait any longer to share the piece. It’s a linoleum block print by Katarzyna Cyganik. Her web site, where I found her work, gives no personal information, so I can’t pass any information on to you, but the work is beautiful and somewhat unusual. Cyganik has a very skritchy style, lots and lots of thin cuts. Sometimes her cuts are fairly controlled as in this forest scene in which she’s made a masterful gradation into a misty distance, but sometimes they’re much sketchier. True to my tastes, my favorites here don’t include the sketchiest pieces, but you can see what I mean if you go to her site yourself. 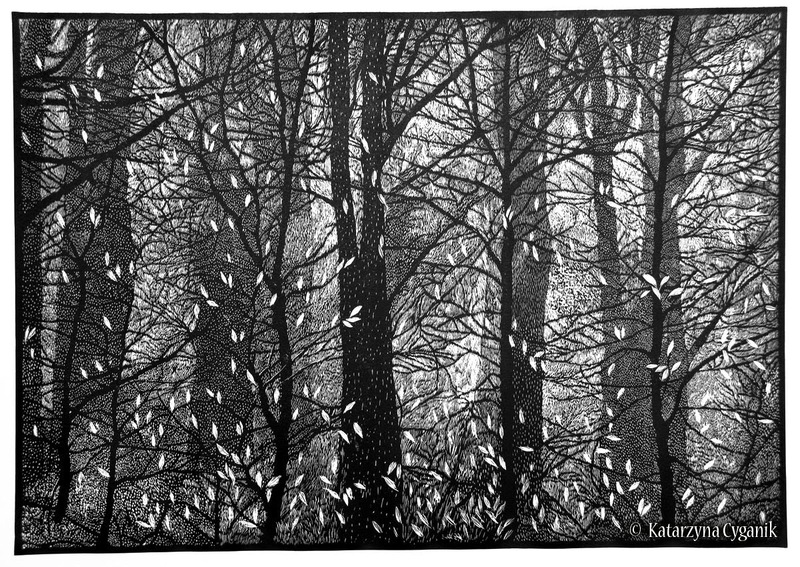 She also has a number of pieces in which the level of texture is fairly uniform over the whole block, but I like best the ones with some punches of black and white along with the texture. I love the way the tiny white leaves are so bright against the “grey” background of the forest. 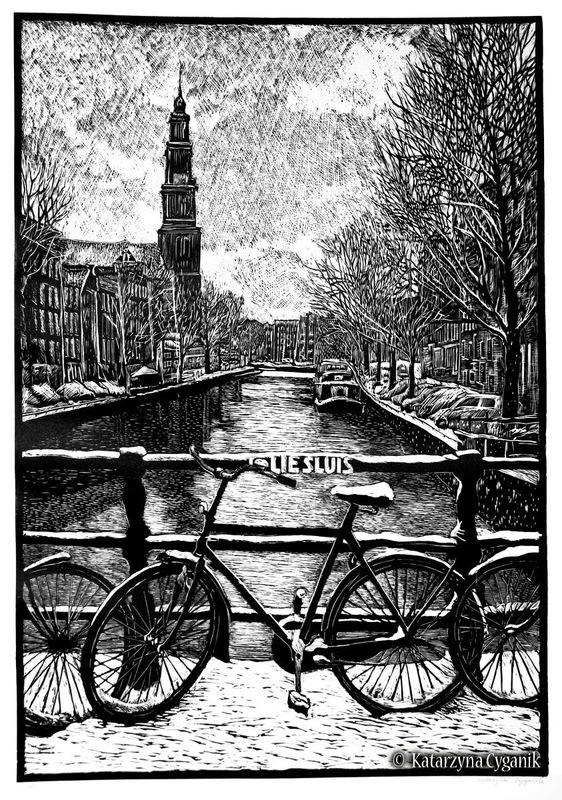 I love the black bicycle and railing against the lighter texture of the snow and the reflecting water. 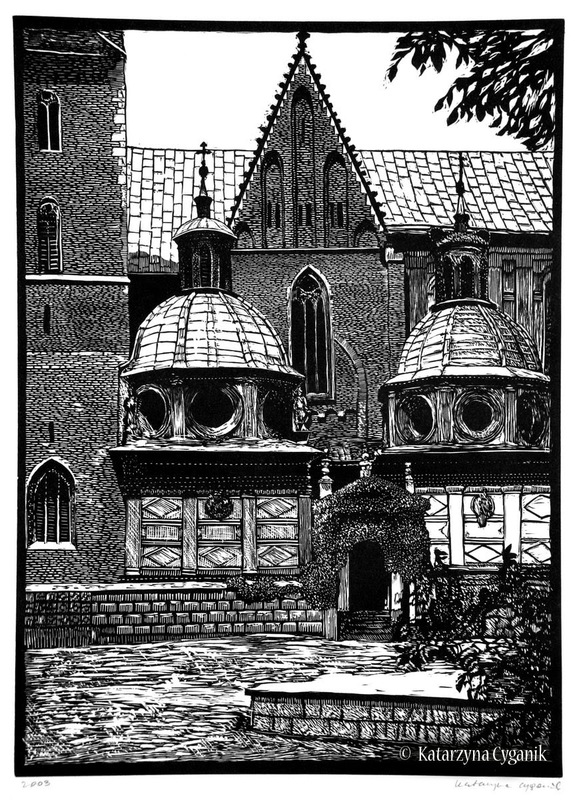 This scene of architecture in Kraków shows off the versatility of Cyganik’s carving. The ground and the shading around the round windows is fairly loose and sketchy, the brickwork of the towers is very controlled. The dark bush in the right foreground shows up even though it’s against a textured background, a technique I have trouble with, and the pattern of the roof, black grid on a white background, is actually one of the harder and definitely most tedious patterns to carve. Every individual white rectangle must be carved out without accidentally putting too many cuts into the narrow black bits that must be left between them. That laborious technique of carving out tons of little white spaces is all over this final piece, too. (Between the two lower left butterflies you can see an artifact of this, where Cyganik has neglected to carve out the linoleum from the interior of one of those little shapes.) 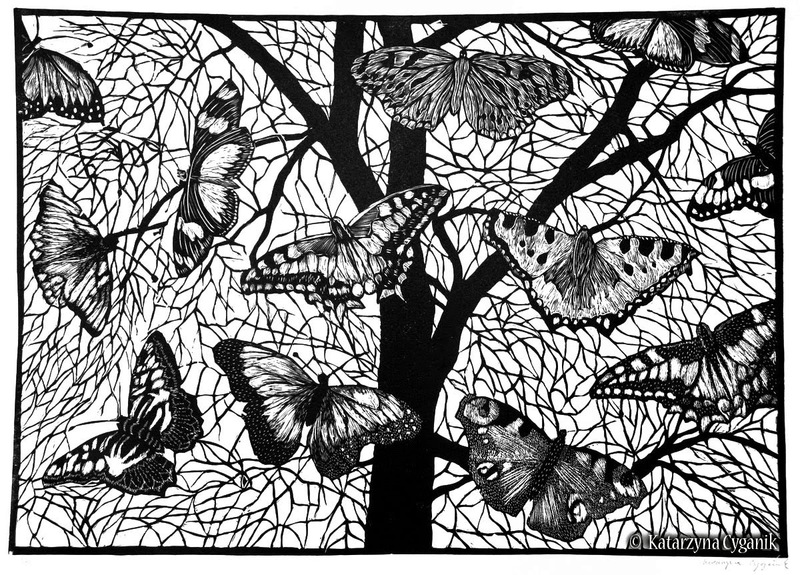 What’s particularly interesting here is that the background seems fairly precise while the butterflies, detailed and in the foreground, have a carvier look. This is the opposite of most artwork. The effect is also much more like a graphic design than her landscapes and other work. All her work is really impressive, and I’m so pleased to have found it. I hope you enjoy it, too. 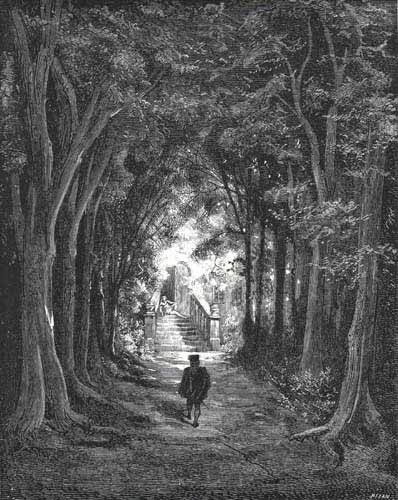 Charles Dickens wrote in 1853 “In a utilitarian age, of all other times, it is a matter of grave importance that fairy tales should be respected.” When I read this it occurred to me how much broader this issue is than fairy tales only. It certainly applies to the whole realm of fantasy, but even beyond, to the ideal of liberal arts. I’ll explain, but first, a few words on Dickens’s agenda. The piece in which the statement appears, called Frauds on the Fairies, was his answer to his [former] friend and illustrator George Cruikshank, who had dared to rewrite some fairy tales to preach his favored cause against the evils of alcohol. 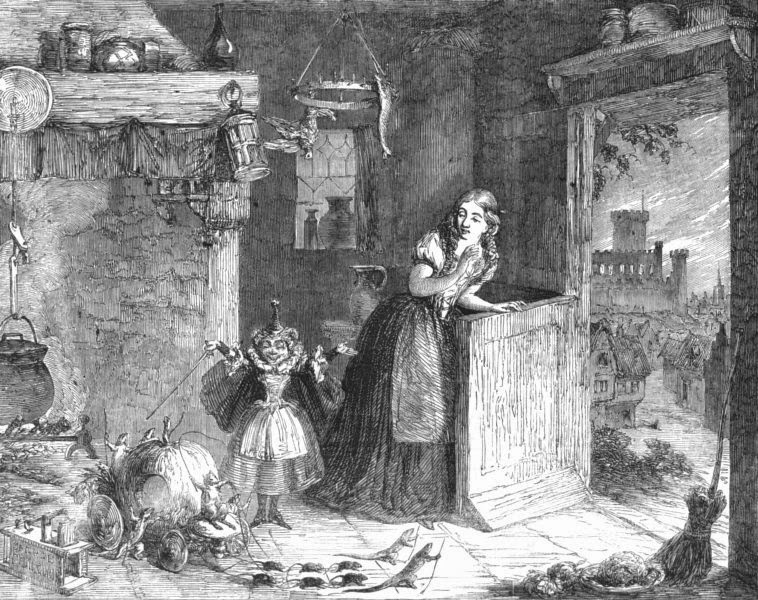 Dickens praises fairy tales for their morality, simplicity, and innocence. He calls them “nurseries of fancy,” with which I agree, but also goes on with a lot of Victorian sentimentalism of which I think the fairy tales must be found Not Guilty. 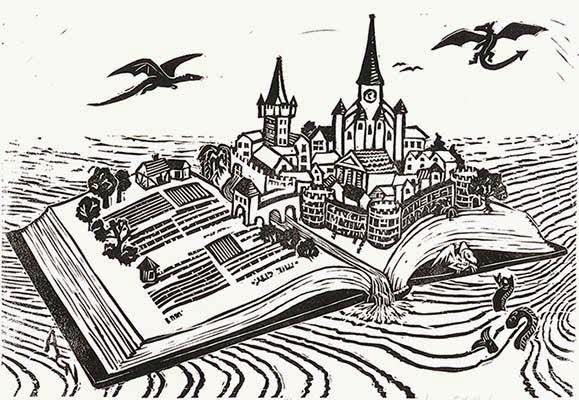 Moreover, he argues that the fairy tales must be “preserved in their… purity,” which is nonsense, as the fairy tales had never been static before and will continue to be retold and modified as long as they live. It’s my opinion that anyone who wants to rewrite fairy tales is entitled to do so, and if they stink, they will simply fall by the wayside. However, you can read the entire essay here, and you may be amused by Dickens’s satirical rewriting of Cinderella, which mocks all manner of absurd moral notions from health fads to women’s suffrage. But to go back to that opening claim, I think Dickens was getting at something bigger than his irritation with Cruikshank. In a utilitarian age, it’s a great temptation to believe that fantasy, imagination, literature, the visual and performing arts, are all useless. Even in my generally enlightened town people write letters to the editor arguing that art and music are a waste of money in our schools. In Dickens’s own time it was considered utilitarian to put young children to work in those jobs too cramped, dangerous, delicate, or tedious for adults. We see now that taking children out of school to perform jobs that are likely to kill or maim them is hardly good for society in the long run, but we still seem to have difficulty seeing that squelching imagination, critical thinking, and broad-mindedness is also bad for society. And that brings me to the value of a liberal arts education, and why it’s important that in this utilitarian age we don’t make the mistake of thinking too narrowly about what’s “useful.” I am very pleased to be featured in this month’s newsletter of The Phi Beta Kappa Society, where I explain the importance of the liberal arts and sciences thus: The liberal arts and sciences encourage a love of continued learning and a broad range of academic interests, as well as the habits of mind that allow us to take notice of interesting facts, follow up a thought to find out more, analyze, sift, critique, and be creative. Creativity requires cross-pollination. It involves pulling threads from many different areas to connect ideas that haven’t been connected before, to create new worlds that reflect our own back to us in new, illuminating ways. Not one of my three jobs [artist, juvenile fantasy writer, stay-at-home-mother] is the kind you might expect to “require” a college degree, and yet my education is a vital part of how (on my best days!) I do my work in all three of those areas: with curiosity, critical thinking, and creativity. And I believe that all of those jobs, done in that spirit, can help make the world a better place. Please go read the whole interview here. 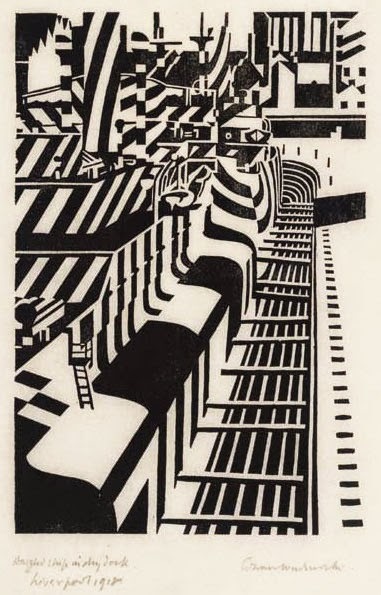 Here are some really funky wood block prints by Edward Wadsworth (U.K. 1889-1949). They look like they might be op art from the 1960’s, but in fact they come from the Vorticist movement of the 1910’s. Vorticism grew out of Cubism, but had more in common with Futurism, with its celebration of dynamism, the machine age, and modernity. Wadsworth was one of the founders of the movement in 1913, but Vorticism proved short-lived as a formal movement. World War I put a damper on many artists’ (as well as the public’s) optimism for modernism, in addition to the fact that a number of members of the young movement were killed. Wadsworth continued to be interested in the bold geometric shapes and patterns, although his work later became more realistic and eventually quite surreal. He continued to favor nautical themes for the rest of his life. 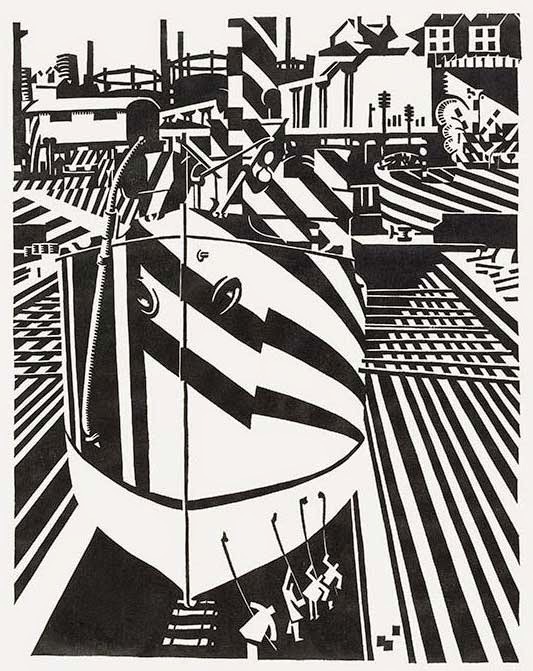 However, it’s the dizzy Vorticist influence in today’s woodcuts that I’m enjoying. These were all done towards the end of World War I, during which Wadsworth worked as a camoufleur. But he wasn’t trying to hide anything; rather, his style of camouflage was intended to confuse, making it difficult for German U-boats to determine the exact speed and direction of ships, reducing their ability to target accurately - think of a herd of zebras, perhaps. 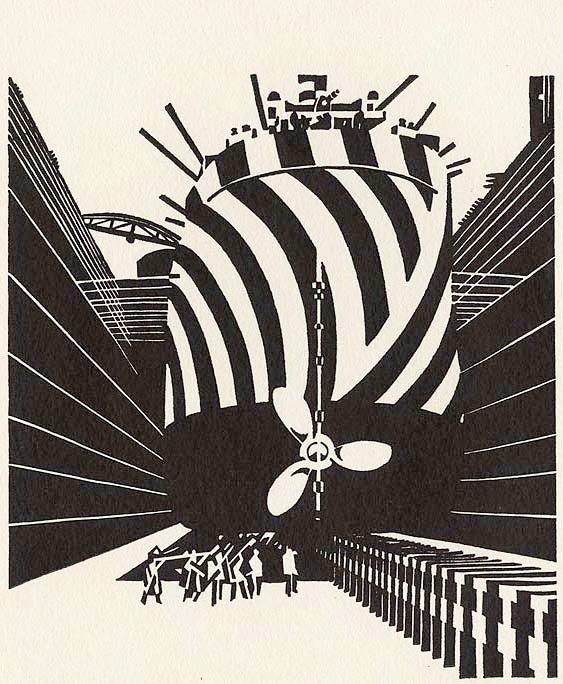 The ships painted in these huge, crazy, geometric patterns were called Dazzle ships. 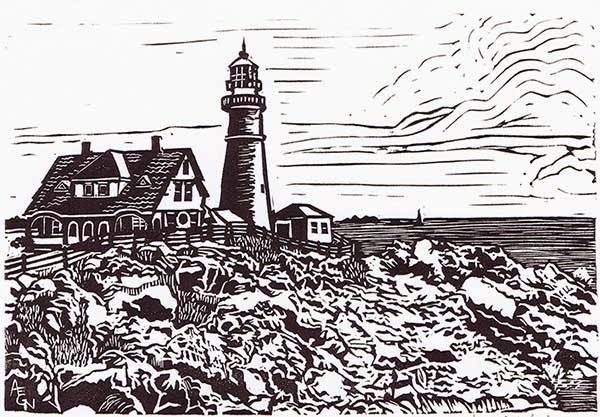 What’s fun about Wadsworth’s block prints is that they employ the same techniques they depict. That is, while the stripes and zigzags on the ships might be quite accurate and realistic, Wadsworth goes farther by using his geometry to break up outlines, confuse background and foreground, play with light and shadow and how they define form, and, in short, dazzle! My favorite is the first, showing a most complete and detailed scene. 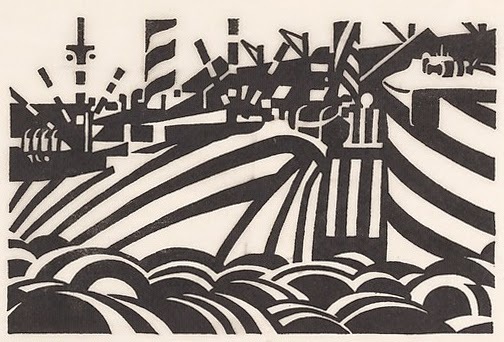 It’s almost exactly the same scene that Wadsworth also used for a major painting the next year, although the painting doesn’t have the dazzle camouflage effect of the black and white block print. 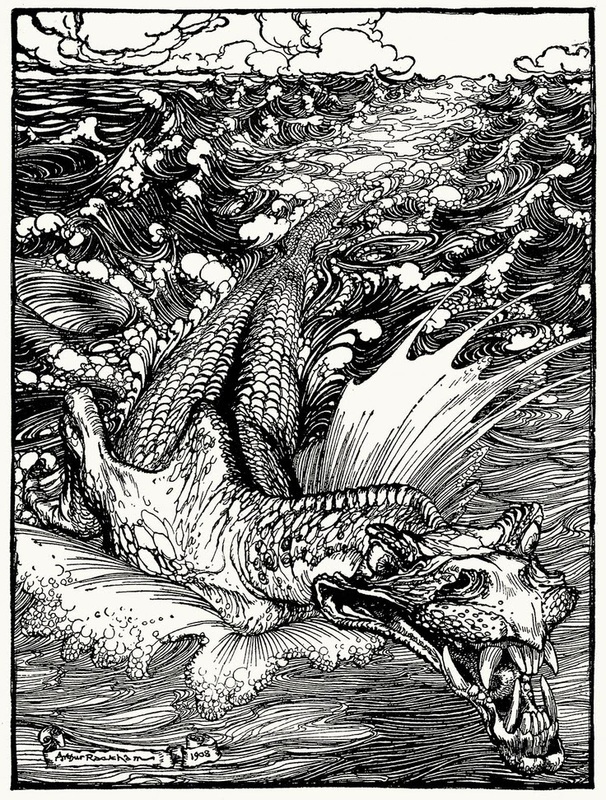 The second piece here is more obviously stylized, with its pillowy waves. Although it’s really simpler than the first, it looks more confused because all the black and white areas are in the same scale. In the first piece I like the way Wadsworth has used smaller shapes as a background for larger shapes, and vice versa. That’s pretty darn bold and sophisticated! The third piece really gives a sense of the size of these ships and the monumental job it was to paint them. By using a low perspective and a simpler background, Wadsworth makes the ship look truly towering. I especially like the curves of its propeller. And finally another busier, more confusing one. I really can’t quite tell exactly what’s going on here. As far as I can make out from the writing underneath, this is another dock scene of another ship or ships, but exactly where any given object begins or ends is tough to discern. Which just goes to show how good Wadsworth was at his dazzling job, I suppose!